Do you live in Benoni? Angies Dance Studio Reviewed by: Angiesstudio Great fun, amazing people, good exercise - well worth a try! 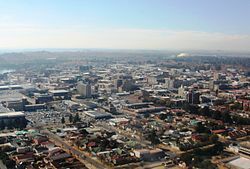 is a city on the East Rand in the South African province of Gauteng. Since 2000, it has been part of the Ekurhuleni Metropolitan Municipality..
Benoni’s inauspicious beginnings date to 1881 when then surveyor-general of the Transvaal Republic Johan Rissik found it difficult to assign title deeds to all unclaimed state property, called "Uitvalgrond", or land that fell out of already claimed properties. He named a piece of land in the area Government Farm Benoni after the Hebrew name (meaning "son of my sorrow"), given by Rachel to her son after she suffered a very difficult birthing. This is according to the biblical Book of Genesis. (Rachel unfortunately died after giving birth to Benoni but his father, Jacob, called him Benjamin “Son-of-my-right-hand”.) Rissik's naming was apparently due to the fact that he had difficulties in establishing the exact boundaries of the surrounding and already existing Rietfontein, Modderfontein, Kleinfontein and Brakpan farms and considered the formal demarcation to have been as commensurately sorrowful as that of the birth of Rachel's son and accordingly named the unclaimed land Government Farm Benoni. On a happier note, it should be understood that Benoni City's existence is primarily due the discovery of gold in 1887, elaborated upon below, where the mines were subsequently concentrated in the Blesbokspruit Valley from the Kleinfontein Dam eastwards towards Van Ryn and Modderfontein Deep Level mines and for several kilometres to the south of the Kleinfontein Dam, mainly to the west of Snake Road. At the time, the mining industry and supporting infrastructure and businesses attracted people from all walks of life and include those from Europe, America, Australia as well as the local Boer, Blacks, Coloureds and Indians and thus makes modern Benoni a veritable stewing-pot of races, creeds and religions. By early 1887 the gold reef discovered in Johannesburg the previous year had been followed by prospectors to outcrops on the Kleinfontein, Vlakfontein and Modderfontein farms in the Benoni area and to that same piece of "uitvalgrond" that had been named Benoni by Mr. Rissik and which, had in the meantime, been leased to a Mr. E. W. Noyce by the Republican Government in 1885. There was a clause in this lease however that stated that should gold be discovered on the property, Mr. Noyce’s lease would be cancelled; and it was here, ironically, in the North-Eastern corner that gold was discovered early in 1887 after which the Benoni farm was proclaimed to be gold-bearing land, some time later on the 9th May 1888. Nevertheless, the intrepid Mr Noyce became one of the Directors of the Benoni Gold-Mining Company which subsequently laid claims on the farm and which was promulgated in September 1887. This was the first registered gold mine in the Benoni area. In September 1887, gold was discovered also discovered on the Modderfontein Farm and the Chimes Mine was established by Cornish men. The mining village became known as “Little Cornwall” for a time. The famous Van Ryn and Modderfontein series mines later established here went on towards some very successful discoveries! In 1895, the Kleinfontein farm was sold to the G & F Syndicate, the primary member being George Farrar (who was later knighted) and who had put his water-boring equipment to good stead towards gold-searching and thus knew that there was gold-bearing reef in the South-Eastern corner of the farm, near to where the first gold had been discovered on the Benoni farm, South of New Modder Road. The huge Kleinfontein Mine dump remains as testament to the success of the New Kleinfontein mine’s subsequent endeavours. Prior to the 2nd Anglo-Boer-war it seems that plans had been made by the Kruger Government to develop a township called Kleinfontein on the Northern slopes of the Blesbokspruit, on Kleinfontein farmland approximately where the older part of Northmead is situated today but this was never developed since it was considered to be too far away from the road leading to Boksburg and Johannesburg in the West. It was also thought to be too distant from the Rand Tram (opened from Boksburg to Springs in 1890 in order to service the coalfields discovered in Springs and in Brakpan) that trundled along far away, just north of Leeupan before curving around near the present day Apex station then back towards Brakpan. In those days, Brakpan did not exist as a town, only as The Brakpan Colliery. Then came the 2nd Anglo-Boer-War in 1899 which ended the Transvaal Government and thus any further plans along that avenue anyway. During the spring of 1902, after the cessation of the 2nd Anglo-Boer-war, Sir George was inspecting the Homestead and Kleinfontein dams (which he had ordered to be built before the war in order to supply water to the thirsty E.R.P.M. mine in Boksburg and the New Kleinfontein mine respectively, and where he held significant financial interests in both: the war had put a halt to gold-mining activities and Sir George had in fact taken a commission in the Imperial Forces during this time and had thus been unable to manage these valuable assets for a while. Some of the Benoni mines’ stamp-batteries and headgear had been burnt down during those tragic days but he was nevertheless impressed with the way the dams had been transformed from unattractive earthworks with sterile shorelines into lush, green oasis of rushes, young willows and sparkling clear waters. It was said to have reminded him of the pretty river Ouse in his home-town of Bedford in the UK. Thus it was that in September, he met with the Kleinfontein Estates and Township Company, (where he held much influence) who also administered the Benoni farm by then, and proposed that the town be laid out on the North-facing slopes of the Blesbok spruit valley, on Kleinfontein land alongside the now-beautiful Kleinfontein dam, and to the West of the then-existing mining shanty-town and present day Snake Road. The board were swayed by Sir George Farrar’s inspirational ideas and duly appointed him the town planner of the new Benoni Township. Bedford Street naturally, came from the name of his home town. (It was renamed Tom Jones Street in 1919 after the then leader of the Labour Party in the Benoni Town Council). Howard Avenue was named after his grandfather who lived at Kempston Grange (spelt Kemston Avenue in Benoni) and who had taken the young Farrar on horserides around the historical Bunyan countryside. They rode to Ampthill, a hill with fine views and then on to Elstow (curiously spelt Elston here) and then dismounted at the Swan Hotel for lunch. Russel Street almost certainly came from the family name of the Dukes of Bedford who happily resided at Woburn Abbey. Cranbourne Avenue was named after Lord Cranbourne, the Colonial Secretary of this country at the time and a good friend of Sir George’s. Wooton (spelt Wootton in England), Turvey, Rothsay and Wilstead are all place names from around Bedford. The area between Taylor and Horsefall Streets (origins unknown) he declared a public open market but Market Avenue was renamed Prince's Avenue after the visit of H.R.H. Edward, Prince of Wales in 1925. The original market square is now occupied by the Benoni Plaza complex. The original Fort Street named after a British fort nearby was renamed Voortrekker Street in 1938 in honour of the Centenary of the Great Trek. Harpur Avenue is named in memory of the founder (Sir William Harper) of his old school, The Bedford Modern which is still in existence today and indeed makes mention of Sir George on its war memorial. The Benoni coat of arms designed in 1937 further continued the connection with Bedford by incorporating, in the centre shield, the triple-castle coat-of-arms of the town of Bedford and in the border, three escallops taken from the coats-of-arms of the Dukes of Bedford. It should be mentioned that Farrar had in fact wanted to name the new township Bedford but there already existed a Bedford in the Eastern Cape (ironically named in honour of the Duke of Bedford of his hometown) so he went along with the biblical name of Benoni that had been bequeathed to the Benoni farm, as cited earlier. Some variations as to the reasons for the name Benoni are detailed in the excellent book “Benoni - Son of My Sorrows”, p27-28, available in the Benoni Library. “Foxy” Farrar, as he was often called due to his clever business nous, (he was renowned as being one of the hugely wealthy "Randlords" of the time) was an inspirational character and apart from being responsible for the laying out of our city, he also ensured that the religious, schooling, sporting and social aspects of Benoni life were catered for as well as his becoming embroiled in local politics later on. Sir George Herbert Farrar bart, DSO was killed in (then) South West Africa during the 1st World War in 1915 in a train accident whilst on active army duty under the command of General Sir Duncan McKenzie who led the initial attack upon the German forces there. He presently rests-in-peace off a small road behind his magnificent Herbert Baker-designed manor house, Bedford Court, (now St. Andrews Girls' School) in local Bedfordview. Thousands of trees were planted in the new mining district and it was officially declared the Township of Benoni in 1906. Residents of that time were predominantly British or those from the Jewish population who had suffered anti-Semitism in eastern Europe, lost all their possessions and who had came to start life afresh here.. In 1907, the first synagogue and the Benoni Race Track were opened. This horse-racing track was breathtaking by its sheer size as compared to the small mining town in which it was situated. The first race was run on Saturday 7 December 1907 and was won by a pony named Fusy owned by John (Jack) William Travis, a Jewish farrier on the gold mines who had come from England. Two unusual prizes were awarded for that first race, a mounted golden whip for the jockey and a gold medal for the owner of the pony. John William Travis imported the first race horses from England for Benoni racing. In 1922, the Rand Revolt (or 1922 Strike) broke out throughout the mines on the Witwatersrand and thousands of white miners went on strike. The strike was partly led by the South African Communist Party and was not well received by the South African Government so soon after the Russian Communist Revolution of 1917. The strike quickly degenerated into open revolt, with armed miners fighting the South African police and army in the streets. The revolt lasted for about a year and the miners were bombed by the newly formed South African Air Force (SAAF) during this time. Some of the SAAF aeroplanes were shot down by groundfire from the miners. During the revolt, Benoni was used as one of the headquarters of the miners and much fighting took place in and around the area. The Benoni Museum details this episode in the town’s history..
During World War II, the South African Air Force trained pilots in Benoni on a site (Presently the Police College) a kilometer north of the old aerodrome which now constitutes the suburb of Airfield. In 1957, in an effort to introduce the sport of rugby league to South Africa, Great Britain and France played the first of a series of three exhibition matches in Benoni. During the apartheid era, designated townships for black people was established outside Benoni, namely Daveyton and Wattville. The township of Actonville was established for the habitation of Indians, whilst Benoni proper was reserved for "whites only". These various suburbs remain although the town is today relatively well-integrated and members of all race groups may live anywhere they please. Benoni has been honoured with three British royal visits, as well as several visits from Princess Charlene Wittstock of Monaco who grew up in Benoni. Today Benoni remains an English-speaking city with rich Jewish history. Due to the string of four lakes; Homestead, Middle, Civic and Kleinfontein, the Rynfield dam and numerous pans, most notably Korsman's, Bullfrog and Sandpan, the city of Benoni is affectionately known by its residents as the City of Lakes..
Benoni is a diverse city. It boasts more horse stables per square kilometer than anywhere in the southern hemisphere. Benoni has over ten schools; in some areas there is a concentration of up to 6000 students within a 5 km radius. Ashton International College was founded here in 1998. Over time gold mining has decreased in importance. Today the city is focused more on industry and services, rather than mining, and is used as a service hub for other East Rand towns such as Brakpan, Nigel and Springs. Benoni is also the site of the Benoni Heliport, for the use of helicopters..
During the 1990s Benoni was the site for the WOMAD Festival (the World of Music, Arts and Dance), an international cultural festival held annually around the world and used to showcase various artists. Oscar-winning actress Charlize Theron was born in Benoni, as was model Genevieve Morton. Benoni was also the setting for the MTV-inspired movie Crazy Monkey: Straight Outta Benoni, released internationally in 2005.. The town is currently represented in the Ekurhuleni Metropolitan Municipality by the African National Congress (ANC) in the majority, with the liberal-democratic Democratic Alliance being the official local opposition. The City Hall, built in 1937, is a good example of Art Deco architecture..
Benoni as a city is served by a good transportation system, by rail as well as by road and by air. There is the Springs-Johannesburg Metro Rail Line running through Benoni south of the Benoni CBD and the Dunswart-Daveyton Metro Rail Line from Dunswart running north of Benoni CBD through to Daveyton. The following routes serve Benoni, the N12, R23, R29 and the R51. The N12 Freeway is an East/West national route connecting Benoni with Springs to the East and to Johannesburg to the west. The R29 is a regional East/West route that is connecting with Springs in the east and with Boksburg in the west. The R23 is a North/South Route that is connecting Benoni with Kempton Park in the north towards the OR Tambo International in Kempton Park and with Heidelberg in the South. The R51 is also a North/South regional route connecting with Pretoria in the north and with Springs in the South. Benoni is also served by the OR Tambo International Airport in Kempton Park and close to the airport..